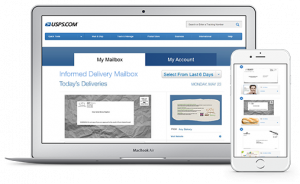 How would you like to know what you’re getting in the mail before your mail even arrives!? A few months ago, I signed up for the relatively new service being offered by the USPS, called Informed Delivery. And folks, I LOVE it! 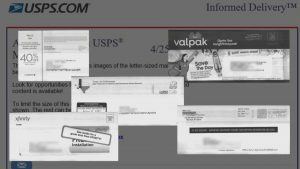 Each morning I get an email labeled “Informed Delivery Daily Digest” and it gives me images of that day’s mail that will be arriving – hours before it actually arrives. I also get notices when a package is on it’s way to me, along with all the delivery details. This feature has been 100% spot on for me so far! I know when it’s worth it to check the mail or to just wait until the next day, haha! This is a completely free service, but it’s not available everywhere right now. To sign up, click here to get started! You can also click here to learn more. 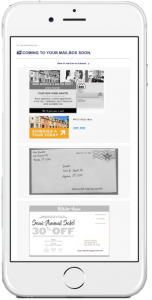 Click here to download the Informed Delivery Mobile App. So I baked this cake last week. Baking is not something I am very good at, haha! 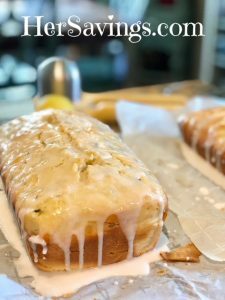 But I wanted to try this lemon zucchini cake recipe from MomOnTimeout. 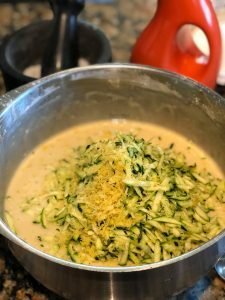 The cake turned out perfectly, and although we think the cake is good, the zucchini gives it an interesting flavor that makes it different from what we are used to. It’s like you can taste the zucchini with your first bite but that’s okay because the cake is really delicious – so you keep eating it! 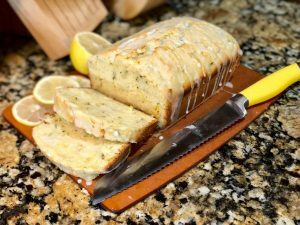 I really liked the simplicity of the ingredients, and I was shocked that no butter was used in this recipe…which made my thighs rejoice!! And for those who are lactose intolerant, like my son, this recipe uses Almond milk! But most importantly, this recipe is easy, which is really important to this non-baker haha! I doubled the recipe so I could make a separate cake for my parents, which they enjoyed as well. I just divided the batter into two loaf pans evenly and baked them at the same time. Both cakes did not last longer than 2 days, ya’ll. 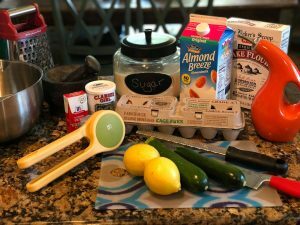 Here is the link to this scrumptious cake: Lemon Zucchini Cake. Try it. And even if you slightly overbake the cake like I did, it’s still really good! Good morning friends! This morning, I am drinking my coffee from one of my new Huskee cups! If you followed me over from Shop4freebies, you might recall a post that I made telling you how to get your very own free Huskee Cups. If you signed up for that offer, your cups should be on their way if you have not already received them. I posted that offer about a year ago I believe, unfortunately, I can’t check because Shop4freebies is no longer an active site. 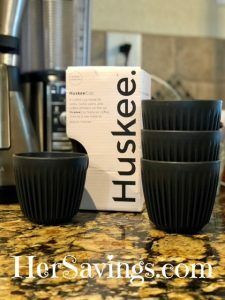 And I am sorry to say, this offer is no longer available, but if you like these cups and want to try them, I will provide a link to the Huskee Cup website. I really like the concept of these cups, they are made with recycled coffee husks, and the design of the cups makes them even more unique. The cups are dishwasher-safe, BPA free, stackable (which I LOVE), and designed to be easy to clean and with comfort in mind. One of the few things that stood out for me was the smell, which was not unpleasant, just different. The smell somewhat reminds me of Patchouli, and I love the smell of Patchouli, just not in my coffee cup. Once you have coffee in your cup though, the smell starts to fade and all your left with is the glorious smell and taste of coffee. And my last issue, this cup is not microwavable! If your a mom, or really busy in the mornings, you know how important microwavable coffee cups are! But, none of these issues are deal breakers for me, the smell fades, does not affect the taste of coffee and I am ok with reheating my coffee in another container if needed. So I still LOVE these cups! I think the uniqueness and the concept of the cups are what pulls me in. Drinking coffee from a cup that was made from recycled coffee bean husks just seems cool to me, and makes me want to invite my friends over to drink coffee form my cool coffee cups…haha!! I want to point out that these opinions are my own. Huskee Cup is in no way compensating me for my views. All they did was send me free cups, with no strings attached. 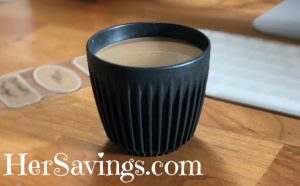 Want to purchase your very own, super cool recycled coffee bean husk cups, or just want to learn more about Huskee Cups? Click here. Here is a great way to snag a FREE Ring Doorbell kit! Simply download the FREE Ring app and sign up for the FREE Crime and Safety Alerts via Neighborhood Watch PLUS and you will be able to get $10 in credits! Even better, each time one of your friends signs up for the free app using your unique link, you will get $10 in credit…which means awesome freebies for you! To get started, simply use this link to download the free Ring app, then sign up for a FREE account by clicking on “The Neighborhood Watch“, NOT “I have a ring product”. You will be prompted to enter your address to join a neighborhood community of watchers. Next, the $10 credit alert will pop up along with your personalized link. Make sure to Copy/Paste and save it immediately and start sharing! Tell your friends about the app and you will get an additional $10 credit for each friend that downloads the app when they go through your unique link. Then you can redeem the credits for FREE Ring products, like the doorbell! Once you get $100 credit (you only need 9 friends to sign up! ), go to the Ring.com website and sign in to your Ring account, your credits will appear. Choose the $99 Ring doorbell, you will be able to choose your color preference, your credits will make this item completely FREE! Shipping will also be free! The Neighbors app and the Ring website are two different things but they “link” your accounts once you sign in with both. 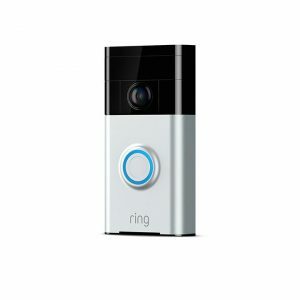 There is NO limit to the number of $10 credits you can earn, so you could get the ring doorbell, a camera with lights, etc. You do not need a ring doorbell to download the app. Whenever someone in your area posts a suspicious incident, you will get an alert via the app so you always know what’s going on in your neighborhood. Ring will keep you up-to-date with crime and safety alerts from your neighbors. It’s as simple as that folks! Feel free to share your links in the comments section to help each other out! Hi folks! If you are headed to your local Walmart soon, make sure you check out the cereal aisle! My local Walmart has various brands of cereal on clearance for just $1.00!! 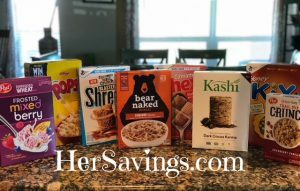 Most of these cereals originally cost over $3.00 each, so that’s a great saving! And if you have any cereal coupons, now’s the perfect time to use them! Please note, not all Walmart stores offer the same sales, same items on sale, nor the same prices, but it might be worth checking your store’s clearance section next time you’re there! 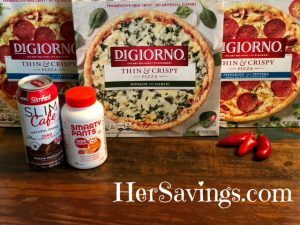 I went to Walmart to use my $6/3 DiGiorno Pizza coupon (still available!) and to snag my free items via free product coupons that I had! I want to point out that you do not have to use the $6/3 DiGiorno Pizza coupon at Walmart, nor do you have to use it on this particular style of DiGiorno pizza. So here’s what was in my basket: The pizza (3) which was priced at $3.50 each, Smarty Pants Gummies were priced at $11.88 and the Slim Fast drink was $2.48. My total after coupons came to $4.50! Click here to see my post about the Walmart Pizza Deal, which is still available! I received the coupon for the free Slim Fast drink form PINCHme. The next round of FREE Samples via PINCHme will be on July 17th, so make sure you are ready! To learn more about PINCHme, click here. And last but not least, I scored the coupon for a free bottle of SmartyPants 90ct Multivitamins from Social Nature, which sadly, the offer is no longer available. Hi folks! I wanted to give you all a heads up that my local Walmart is having a HUGE fragrance clearance event going on right now – and perhaps yours is too! 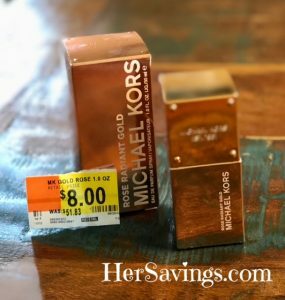 I was able to snag a Micheal Kors Rose Radiant Gold perfume for just $8.00, regular price was $51.83!! My local Walmart had all different brands of perfume, cologne and body spray on sale. 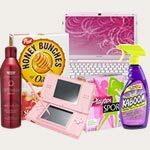 Brands included a variety of Micheal Kors, Juicy Couture, Dolce & Cabana, Tommy Hilfiger, and so much more! Prices ranged from $2.00 and up! Please note, not all Walmart stores offer the same sales nor the same prices, but it might be worth checking your store’s clearance section next time your there! I LOVE Nature Nates Honey!! Every once in a while, I come across a company that goes above and beyond for their consumers. Nature Nate’s Honey is one of those companies. This company truly cares about their products, and about the people buying their products. Nature Nate’s honey is a staple in our home. My husband and I use it on our coffee every morning, we use it in baking, cooking, tea and when we have a cough or a sore throat, we take a spoonful of it and it really helps soothe our irritated throats. 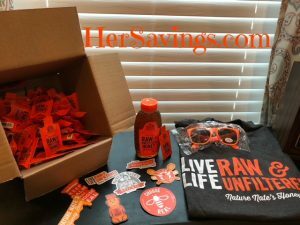 Around Easter time, I posted about a sweepstake that Nature Nate’s Honey was having (expired), and today I received a surprise thank you gift in the mail (see image above) just for sharing that sweepstake with all of you!! Not every company is as caring as Nature Nate’s! So folks, if your store carries Nature Nate’s Honey, definitely give it a try, it’s one of the very best honey that I have tried! And make sure you sign up for their facebook page so that you can be aware of all the fun promotions they have! Click here to find a location that sells Nature Nate’s near you. 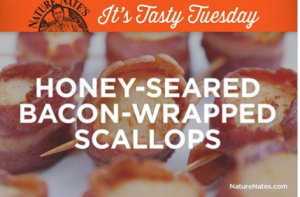 Also, check out this scrumptious recipe for Honey-Seared Bacon-Wrapped Scallops, courtesy of Nature Nate’s Honey! I Picked Up My HEB Freebies! 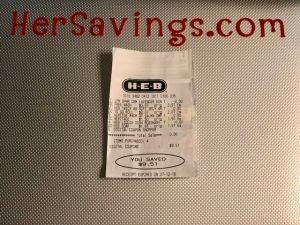 Have you snagged your HEB freebies yet? I ventured to my local HEB this morning and picked up my digital eCoupon freebies! 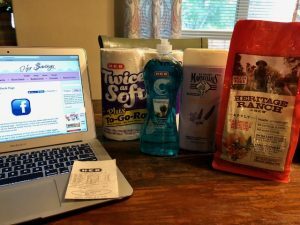 I was able to score toilet paper, dish soap, some really nice smelling body wash and dog food, completely FREE – I saved $9.51 (before tax total)! You can find out more information about these eCoupons from HEB by clicking HERE. I picked up this new scent of Clorox wipes yesterday at Walmart, and I have to admit, I have a very strong urge to be on a beach, sipping a Pina Colada when I am using them. The scent is Pacific Breeze & Coconut, and it’s very refreshing, it made cleaning up a breeze – pun intended. I now want to purchase the whole product line of Clorox products with this scent. I want to point out that Clorox did not ask me to say this about their products. 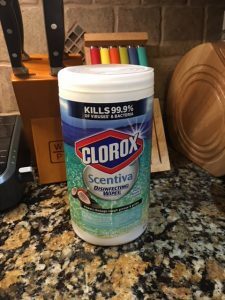 This is my own personal opinion, I just happen to be obsessed with this new product line from Clorox!